Gallery walls are my jam! The walls I put together are how I’m mostly known throughout the Instagram community. I just love being able to put together pieces that originally wouldn’t have gone together! I get a lot of questions about how I put together my walls. How do I hang up everything? What happens when I get tired of pieces? Let me start off by saying you can do exactly what I do! Trust me! Everyone has a creative bone in their body even if you don’t think you do! 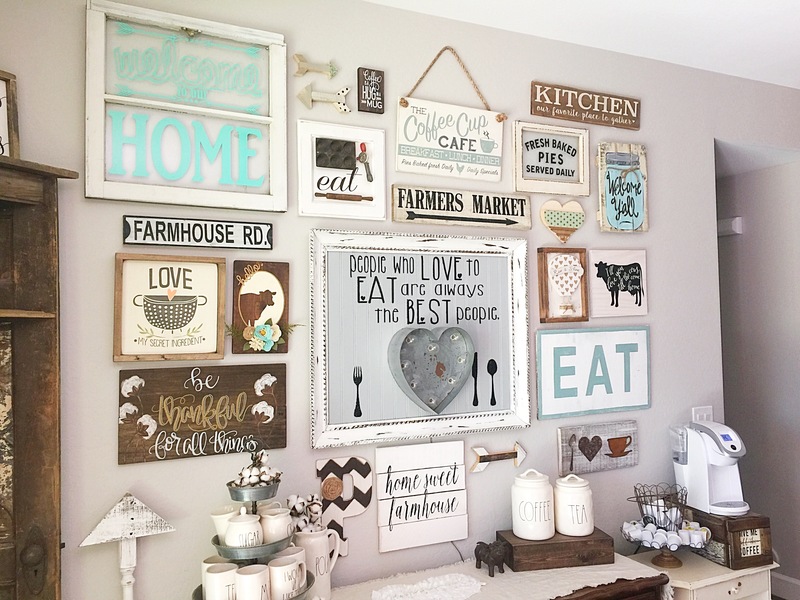 Did you know that anything clustered together over 2 pieces is considered a gallery wall? I bet some of you have gallery walls up right now and you didn’t even know it! The key to a successful gallery wall is what I like to call an inspiration piece. You base your entire wall off of that piece and draw inspiration from it. The “people who love to eat” metal heart piece featured above was my inspiration piece for this wall. This actual piece happens to be a “Nicole original “. I had an idea, brought my idea to a fellow maker friend of mine, and tada (cue the fairy dust) it was brought to life! This piece was one of the firsts collaborations I had ever worked on! Now designing this wall….. I will say there are ALLOT of holes, paint chips, and possibly five larger dents that decor pieces are covering but it was my first ever gallery wall. We all learn from our mistakes right? I speak spackle, sand paper, and touch up paint fluently now. 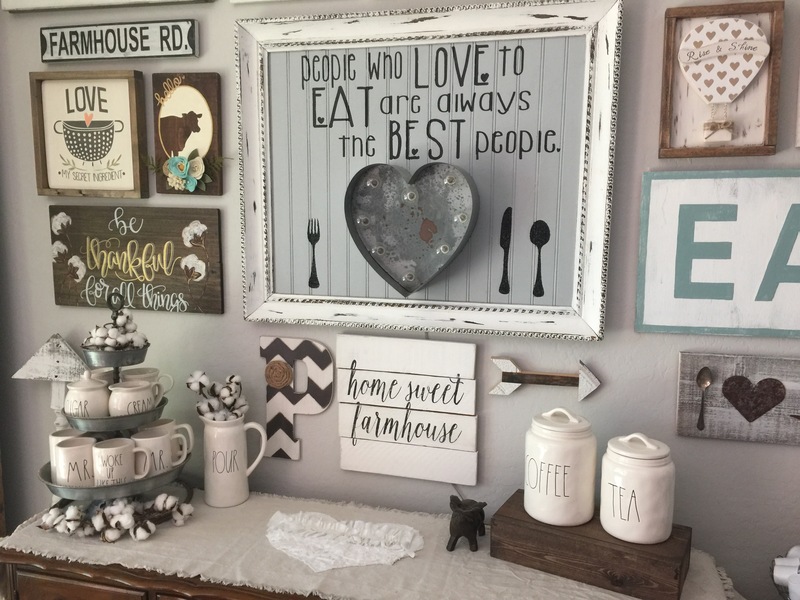 Honesty there is no wrong or right way to put up a gallery wall! The best piece of advice I can offer you is to lay it all out on the floor and add or subtract to your liking. Some people are perfectionist… I am not. I DO NOT MEASURE. I just don’t. I eyeball everything…. which is probably why this wall ended up with the holes and dents but to each their own! I try to square off my walls as best as I can. Squaring off your walls is designing it to fit into an imaginary square. I love that look and it is what works best for our walls. Now It’s time to get to the bread and butter of a gallery wall, hanging it all up! I want to tell y’all I have a love affair with command strips. This glorious invention was introduced to me by a family member who helped me hang this very wall. I will say once you go command, you’ll never go back I promise! If and when you want to change out pieces these guys make it so easy!!!! The heavier pieces on my walls I hang with screws and wall anchors, but the medium and small pieces are all hung by command strips! 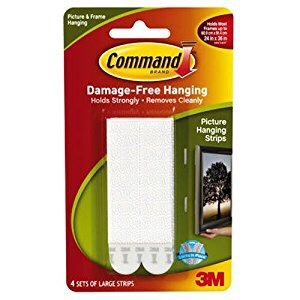 Once you hear that glorious clicking sound of two command strips attaching together it’s like you’ve won a small victory! I am a firm believer in the more command strips the better. If you think a piece calls for one, use two. I’m not kidding! The best piece of advice I can offer when tackling a gallery wall is to always have someone help you when you hang! Your walls will thank me! Just remember that most decorating isn’t about making staged sets, it’s not about making pretty pictures for magazines; it’s really about creating a quality of beauty that nourishes the soul. I’d love that!!!!! Thank you!! Let’s connect! !